Home > Online shopping > Shutterfly Coupon Code: $10 off $10 Purchase! 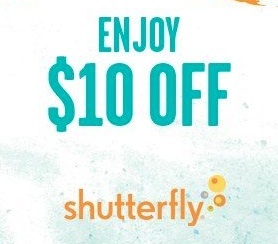 Shutterfly Coupon Code: $10 off $10 Purchase! Make your own photo deal at Shutterfly.com coupon code for $10 off a $10 purchase! These are awesome, and a great way to end up only paying shipping on a number of items. At check out use code 10off10. Get three greeting cards and only pay shipping. Make a personalized notebook and pay $2.99 +shipping. Create a mousepad and only pay shipping. Make a personalized shopping bag for $1.99 +shipping. Get two photo magnets and only pay shipping. Order 67 4×6 prints and only pay shipping. A few of these options will have your total a little less than $10 before the coupon, so add a couple prints at 15¢ to bring the total to $10 so you can use the coupon code. Shipping will vary based on what you order. I ordered the 67 photo prints and shipping was $3.99 shipping or basically 6¢ a print. This offer ends 8/20 at midnight. What did you get and what was your shipping?